Do you need to provide your website visitors, customers, or clients with directions to your store, office, or business location? 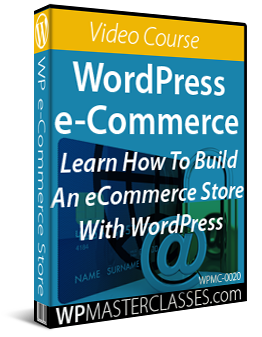 In this step-by-step tutorial, you will learn how to easily create and add maps and driving directions for your site visitors without touching code. 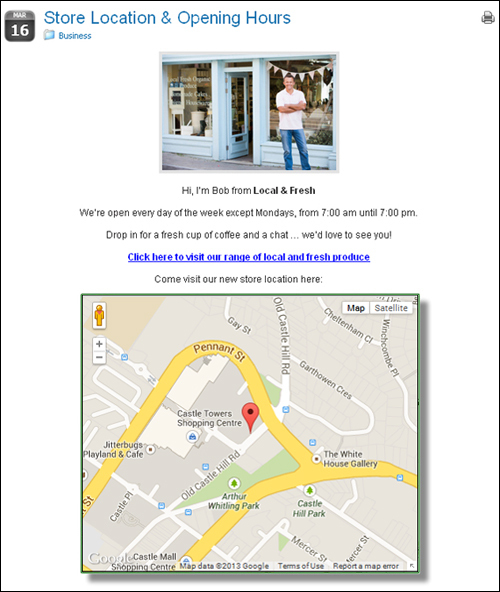 Being able to add maps on your site and share driving directions to your store, office, or business location with your site visitors provides potential customers and clients with a very useful service. 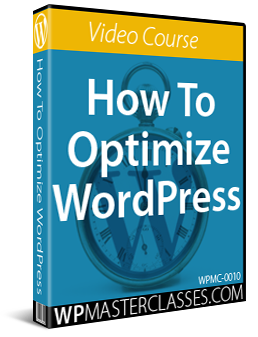 The easiest way to integrate Google mapping technologies with WordPress without touching code is to use a WordPress plugin. 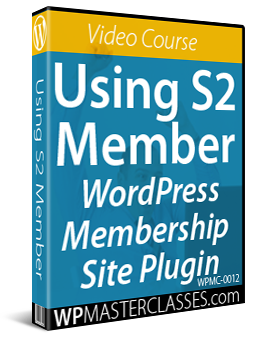 There are many plugins available for WordPress that let you add maps to your site. 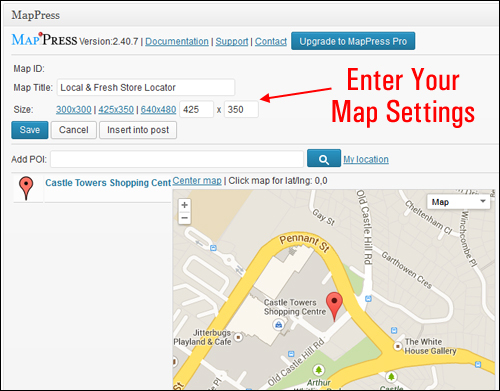 For this tutorial, we are going to use a free WordPress plugin called MapPress Easy Google Maps to add maps and driving directions for your site visitors. 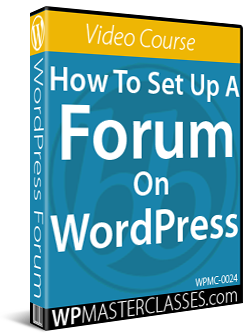 This plugin allows you to create great-looking Google Maps and driving directions and easily add them to your WordPress site. 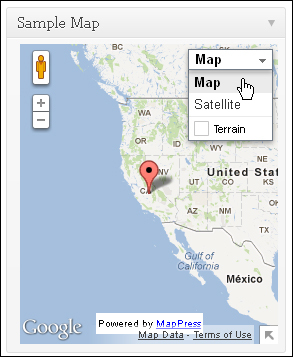 Specify where to show maps automatically, or disable the automatic display option. Add maps to posts and/or pages and custom types. 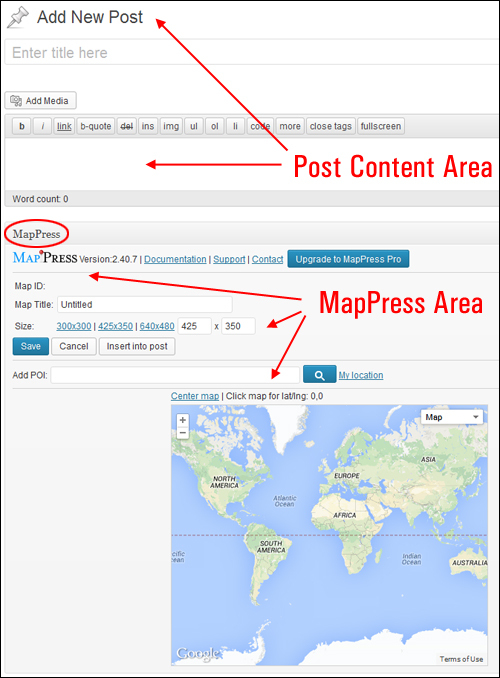 Add maps into your content using shortcodes. Display directions (inline, Google, or none). Allow visitors to change map types (street, satellite, hybrid). Enable zooming with the mouse scroll wheel. Enable keyboard panning and zooming. 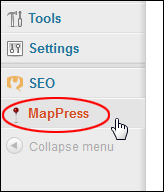 MapPress is available as a free download from WordPress. 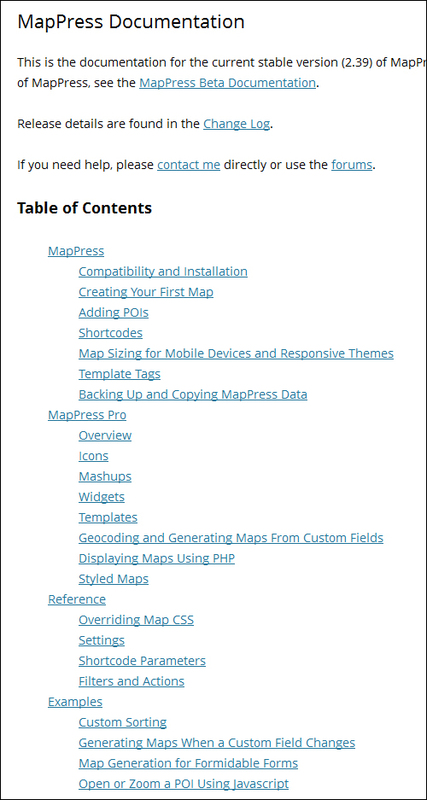 The Pro version of the plugin provides many additional features, including custom icons, mashup maps, marker lists, map generation from custom fields, and more. Each of the sections in the plugin settings area provides a range of configurable options, giving you complete control over the way your maps display on your site. 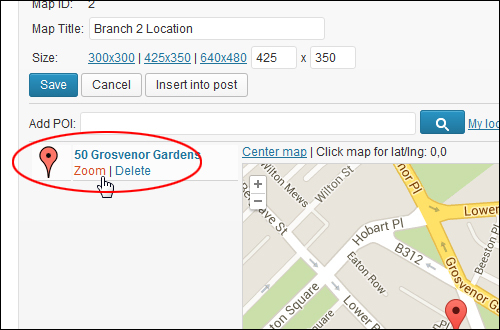 Automatic map display – Automatically display maps in each post without adding a shortcode (if a shortcode is present in a post this setting is ignored). 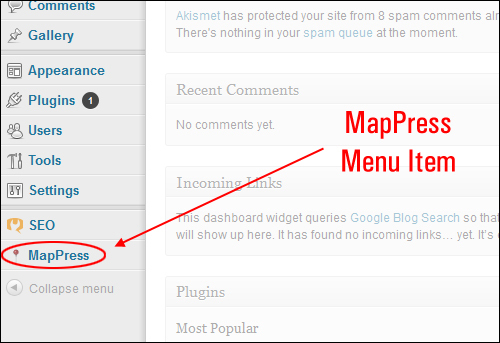 You can specify a default position for displaying map(s) on your site (top of post, bottom of post), or turn off automatic display. Directions – Specify where to display directions: ‘Inline’ displays directions inside your content. ‘Google’ opens directions in a new Google Maps window. ‘None’ suppresses the direction links. 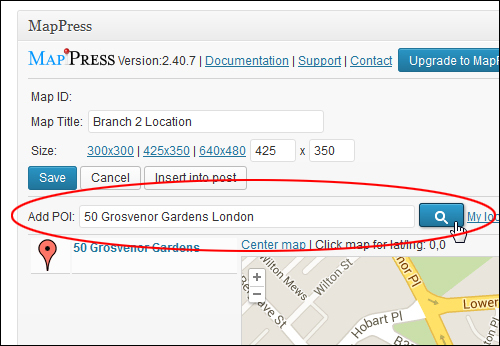 When you enable a post type, MapPress displays a configurable map section in the post type’s content edit area, allowing you to create maps for individual items (e.g. 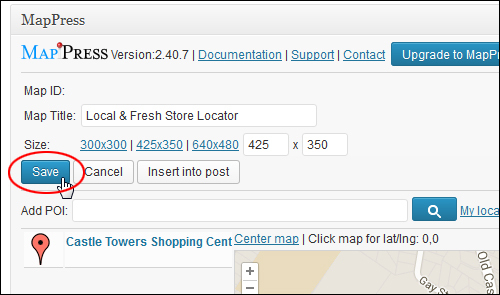 posts or pages) and customize the map’s settings for that particular item. 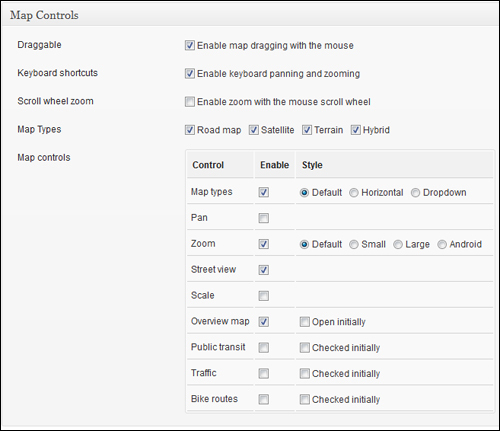 The Map Control section provides a range of map control options for users, including the ability to move around the map dragging your mouse, panning and zooming options, map types (road map, satellite, terrain, hybrid) and the ability to enable or disable control features. The Map Settings section allows you set the default options for features such as map links, map alignment, map border formatting, and whether to automatically open the first POI (Point Of Interest) when displaying a map. The POI Settings section controls parameters for displaying points of interest on your maps. 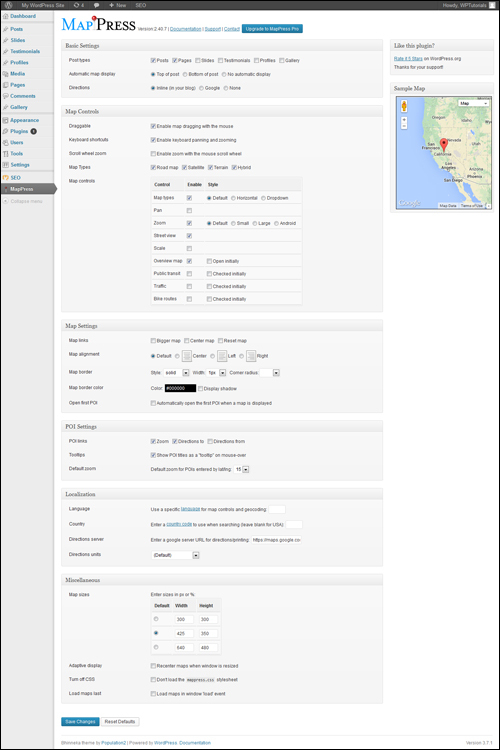 The Localization settings lets you configure map language and country settings (links to reference sites are provided) and modify the directions server. 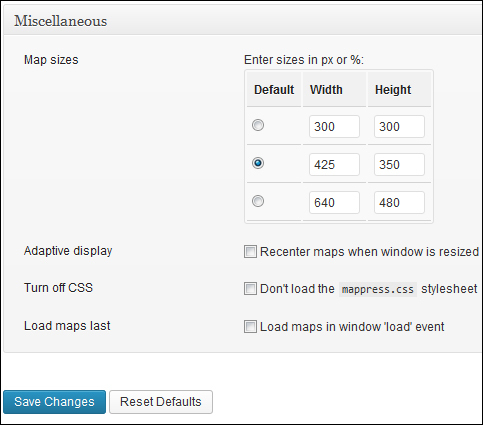 The Miscellaneous section allow you to specify settings like default map sizes, enable or disable adaptive display, turn off CSS (Cascading StyleSheets), and specify whether to load maps after all other content has loaded on the page. 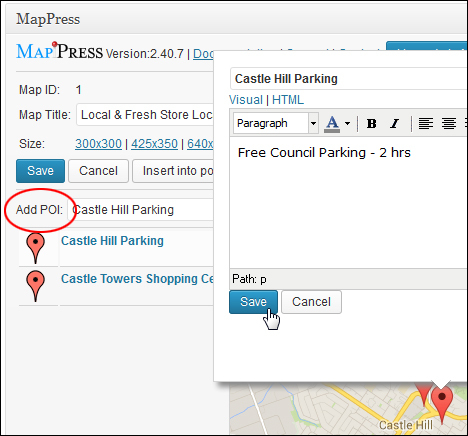 MapPress Pro version includes additional features, such as the ability to set a different icon for each marker, add custom icons, use mashups (the ability to combine multiple maps into a larger single map), use geocoding, add widgets, set templates for your marker list, automatically create maps from custom field data, set custom map sizes and more. 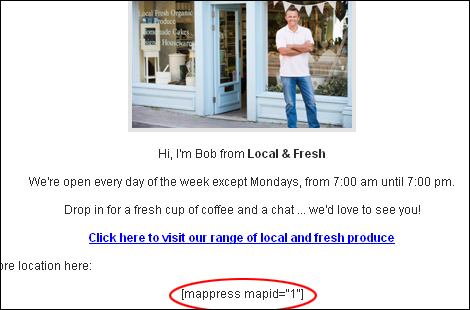 The MapPress plugin is very easy to use. Note: The plugin documentation has a number of examples of different ways to customize your maps using shortcodes (see end of tutorial for links to plugin documentation). 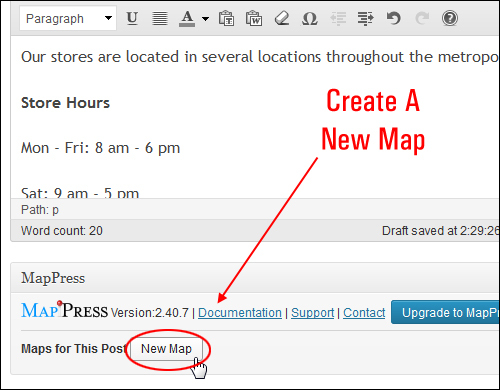 To edit an existing map, go to the post or page containing the map you want to modify, then scroll down to the MapPress section and hover your mouse over the Map Title. Make the changes you want to your map. For example, you can change your Map Title, specify a new Map Size, add new/multiple POIs to your map, edit your POI descriptions, and more. Your map will be updated with the new changes after your post or page have been republished. 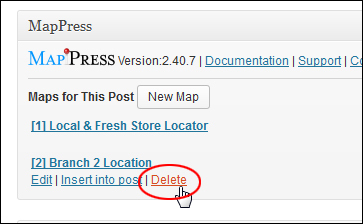 To delete a map, go to the post or page containing the map you want to delete, then scroll down to the MapPress section and hover your mouse over the Map Title. Your map will be deleted. 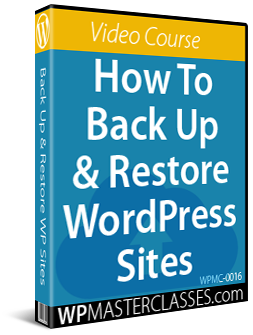 WD Google Maps is a WordPress maps builder plugin that lets you add unlimited maps to your site, create multiple markers, add store locators, and instantly preview changes you make to your maps before publishing. You can download a free version of the plugin with limited options, or the premium version with advanced features like customizable map settings, custom marker icon builder, ability to draw shapes in rectangles, circles, polygons and polyline, customizable map skins & themes, get directions, and more. Congratulations! 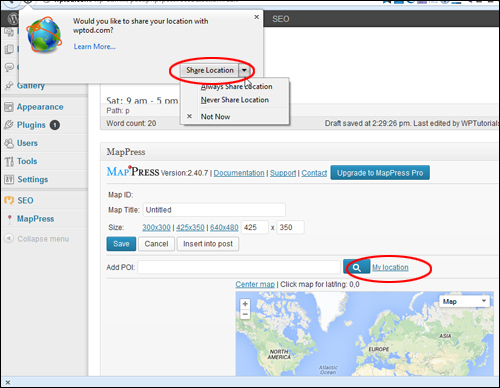 Now you know how to add maps to WordPress.